This is a labor of love for Robyn Webb, a passionate traveler and Paris lover as well as an award-winning cookbook author, nutritionist, culinary instructor and motivational speaker. We are honored that “Guest Apartment Services Paris” has been selected as one of the handful of Paris rental agencies included in The Paris Vacation Apartment Guide. 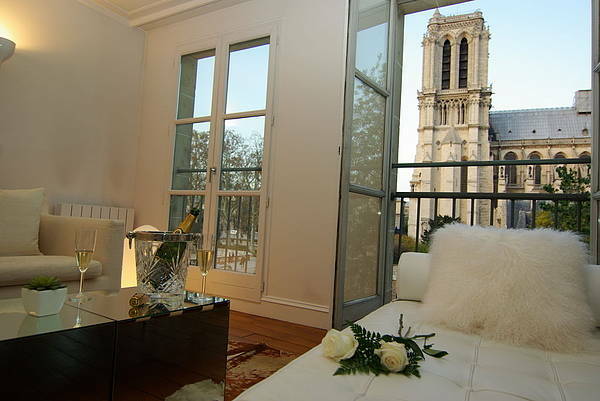 Snowdrop, a luxury designed property face to face cathedrale Notre Dame. August 2011 – "How can we thank you enough for a most tres magnifique stay with you in Paris! Our apartment was a dream and every moment we spent in it was heaven. Even though we have been to Paris many many, times and did not require much assistance from you, your wonderfully warm hospitality was so very much appreciated. Having spent time in some of the top Paris hotels including the very top Four Seasons Georges V, they have nothing over the fabulous Snowdrop apt. It was far, far, far better than any including the best Paris hotels. As a chef and cookbook author, it was pure joy for me to go to the markets and bring back all my goodies to prepare in our inviting kitchen. The kitchen is so well stocked, I took note of a few things I'd like to have in my own professional kitchen! Best of all even though you are on a busy thoroughfare, it apt was nice and quiet especially the bedroom. It was fun gazing at all the tourists teeming around Notre Dame. And watching the booksellers performing their trade from up above through the floor to ceiling windows was so quintessential Paris! I would highly recommend Guest Apartment Aervices to anyone wanting a classy, beautiful apt. The opportunity alone to deal with such fine gentlemen as yourselves was worth every euro! Feel free to use the above as a testimonial to use on your website for the Snowdrop apt. Merci Beaucoup, A bientôt, Robyn Webb". 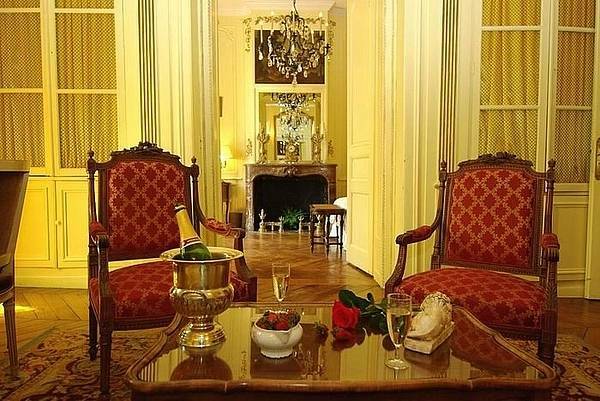 Orchid, a Luxury large and stylish Parisian property for family and friends Special Occasion. High Ground floor on historical building with views on Seine River. A modern lifestyle inspired by the 18th century spirit. June 2013 – "Merci beaucoup! We loved our stay in the Orchid apartment and will be sending a review you can post on your website about the apartment. I'll have that to you today! As usual our stay was parfait, everything is always done with ease and professionalism by you I'm so glad to see how much you have expanded and I know my friends Pam and Bruce are going to just love you all. As much as I'd rather be in Paris right now, we are indeed getting ready to celebrate our Nation birthday tomorrow and that is always fun. I'll be thinking of all of you on Bastille Day! Stay healthy and well everyone and soon we will be in Paris again! A bientôt, Robyn Webb". Part Un – This section is ideal if you’re booking your first vacation rental in Paris and aren’t sure where to begin. Robyn guides you through the ins and outs and the key points to keep in mind while apartment hunting in Paris. Part Deux – The second part delves in great detail into each of the 20 arrondissements in Paris and includes Robyn’s notes for the best neighborhoods and streets to stay on in each area. You’ll also find her tips on what to see and the best shopping spots, too. Part Trois – Here’s where to head when you’re ready to book your apartment and are looking for the right vacation rental agency. There are a handful to choose from in Paris, but we hope we’ll be the right fit for your stay! 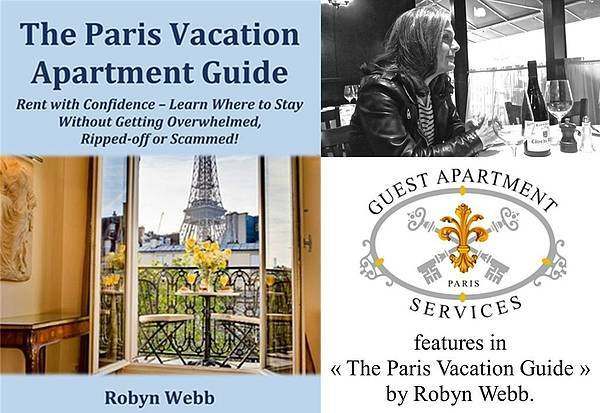 Part Quatre – The finishing touches for the book appear in the final section that includes Robyn’s tips on transportation, excellent food shopping spots, safety and tips for fitting into the Paris lifestyle. This guide is ideal for wealthy travelers, families on a budget, girlfriend getaways, jaded tourists ready for an insider’s experience, and anyone who loves Paris! At the end of each hyperlinked chapter is an easy-to-read recap of all the key points. If you’re planning a trip to Paris and are considering staying in an apartment rental, you’ll enjoy The Paris Vacation Apartment Guide. It’s full of tips that make it especially handy for first vacation rental newbies or seasoned Paris travelers looking to experience a more authentic Paris stay. You’ll find all the information below for connecting with Robyn Webb online and buying the book. The Paris Vacation Apartment Guide now available to buy on Amazon. Looking forward to welcoming you in Paris !